When I first got into blogging in 2004, one of the most prominent voices in the blogosphere (she was, and is, also a newspaper columnist) was Melanie Phillips, who by that time wrote for the Daily Mail (she had previously written for the Times and before that, the Guardian). She is widely known on the anti-war left and among Muslims as “Mad Mel”, for her seemingly hysterical denunciations of any concession to Muslim sensitivities and her fanatical devotion to the interests of Israel (not so fanatical as to go and live there, mind you) such that she would repeat the propaganda from the likes of MEMRI, “Honest Reporting” and the like as if they were facts, and accuse people of anti-Semitism if they treated Palestinian claims to their own land with anything but the contempt she believed they deserved. The “Mad Mel” soubriquet came because of her repeated insistence that “the West” was selling itself out and allowing itself to be destroyed from within by the Left, Muslims, and assorted other enemies. Yesterday, Craig Murray noted that Phillips had written a quite ludicrous article claiming that “with the re-election of Obama, America now threatens to lead the west into a terrifying darkness”, and calls this “ill-motivated” and “barking mad”. There is a blog on the Independent’s website, taking a similar tone, here. However, my impression is that Phillips has always known exactly what she is doing: serving the interests of Israel and attacking its real or potential enemies. Some columnists may be accused of wilful exaggeration, shouting to be noticed, and then having to go further simply to keep ahead of the game. Phillips is not like this. She is not cynical, or saying it for effect. She means every word and the key to her analysis is her belief in a general collapse of values or, in her words, “the creation of a debauched and disorderly culture of instant gratification, with disintegrating families, feral children and violence, squalor and vulgarity on the streets”. This is combined, she believes, with a profound anti-semitism among people who do not realise that “the fight against Israel is not fundamentally about land. It is about hatred of the Jews”. She hears echoes from the past today, talking of “a climate in Britain that has alarming echoes of Weimar in the 1930s”. 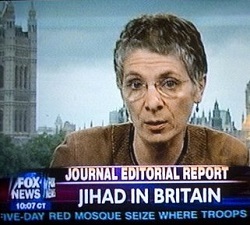 Perhaps Phillips’s tone may give the impression that her attitudes are the product of a disturbed mind; however, since 9/11 she has followed much the same agenda as Mark Steyn, Daniel Pipes and Robert Spencer in decrying “multiculturalism”, particularly where it concerns Muslims, insisting that there is an equivalence between non-violent ideological Islamists and the likes of Osama bin Laden, supporting the American invasions of Iraq and Afghanistan virtually without question, and supporting Israel to the point of echoing all the propaganda issued by the Israeli intelligence-backed “news” agencies. Yet we don’t talk about Raving Robbie and Demented Dan, perhaps because they are smoother and don’t speak with quite the same urgent tone. My impression of Phillips is that she is playing to her overseas audience, particularly her American Jewish readers. 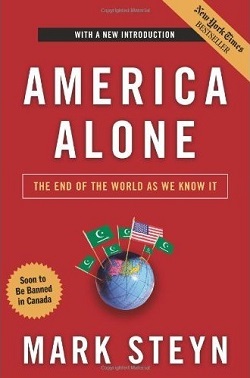 A common theme of the Europhobic, Islamophobic American right is that Europe is selling its culture out by making deals with the Arabs while America “stands alone” in defence of Western civilisation and, of course, Israel (one remembers the cover of Mark Steyn’s book America Alone, with an American flag surrounded by a sea of green crescent, star and sword flags), and they lap up any story about European governments capitulating to Islamists by hiding piggy banks and so on, along with tales of how Jews are cowering in their houses from “the new Nazis” (Muslims). Among the proof of her playing to that gallery are the smattering of geographical inaccuracies in Londonistan such as claiming that Mark Cross, the village where a group led by Abu Hamza supposedly hired an Islamic school to run a “terrorist training” facility, was “deep in rural East Sussex” when it is in fact just six miles from Tunbridge Wells, which is in Kent, and barely an hour’s drive from London; she also alleges that in London, “district after district seems to have become a distinctive Muslim neighbourhood”, which is simply untrue except maybe in one part of east London. There are other examples of her playing on her American readers’ ignorance of British geography and political and media culture, as well as American usages such as “Prime Minister Blair”. A number of years ago when I paid more attention to the ravings found on the American blogosphere than I do now, I coined the term “truthspace”, referring to a kind of reality bubble where speakers and writers come out with claims that are demonstrably false, but this does not matter to their audience with whom they are ideologically united and they agree on the ‘necessity’ of these claims being accepted as truth, even if they are not. Phillips does strike a chord with some British conservatives, and even Muslims on some ‘life’ issues, but her protestations that the world is collapsing around our ears and that Europe is capitulating to the Muslims is aimed at her fellow Israel-firsters in the USA and perhaps a few in the rest of the English-speaking world and in Israel itself. We may call someone ‘mad’ when they are fanatical or unreasonable, or their world view appears to be divorced from reality, but apparent ideological blindness and fanaticism are not forms of mental illness. Phillips is not “barking mad”. Her ludicrous claims are the product of ideology, not illness. Shock news: Arabs don’t wear poppies. Cabbie talks out of his backside.